Last August I went to China with four friends. 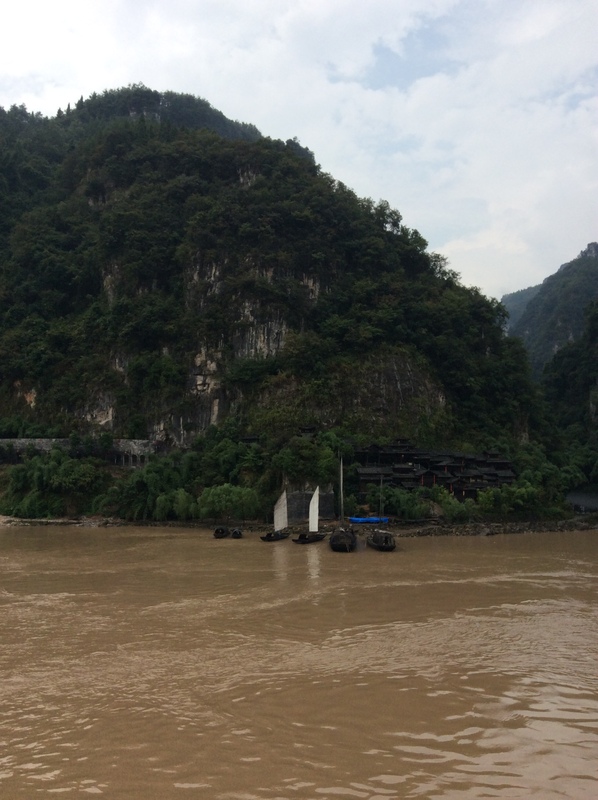 We did Viking’s Imperial Gems cruise, which was a week on land and a week on the Yangtze River. We stayed at classy hotels in Beijing, Xi’an and Shanghai. A truly unforgettable trip. 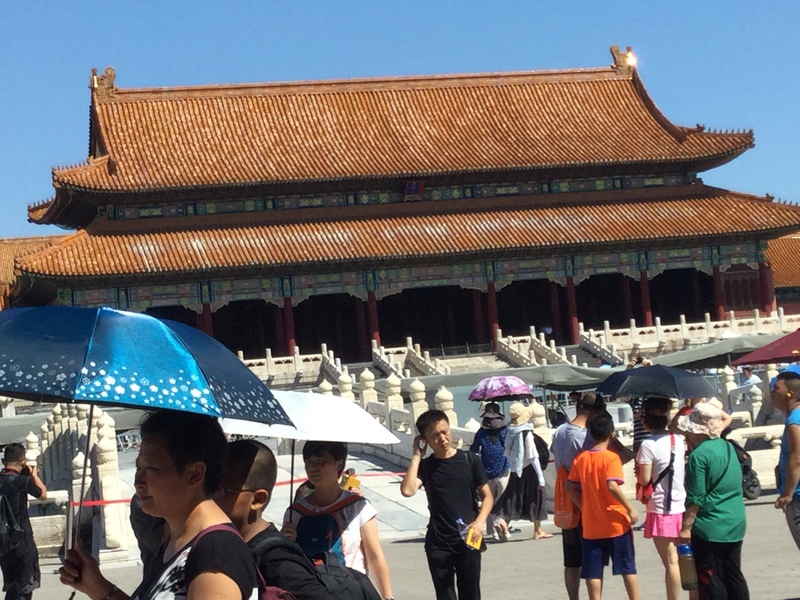 The photo to the left was inside the Forbidden City, which we visited on our first day in Beijing. A hot, humid day also crammed with visits to Tiananmen Square, an artist’s private home, and lots of walking. Larry was a dream guide filled with information and lots of patient attention for his tourists. Traveling down the Yangtze River was on my bucket list since I saw a 360 degree show at Disneyland narrated by a poet. The river has changed over the centuries especially in the modern era. I’ve never seen so many skyscrapers or dams or different styles of locks. The river has a muddy appearance. The bridges were fantastic from ancient to modern. Lots to do on the boat. I had a nice conversation with a lady selling teas and tried some lovely varieties. I bought a snow chrysanthemum herbal, which is supposed to be great for colds. Our tour group visited a tea house during the land tour and tried even more varietals. I’m a tea drinker from way back so this was a highlight. Another stop was to see the Terracotta Soldiers. From Wikipedia: The Terracotta Army is a collection of terracotta sculptures depicting the armies of Qin Shi Huang, the first Emperor of China. It is a form of funerary art buried with the emperor in 210–209 BCE with the purpose of protecting the emperor in his afterlife. Seemed impossible to take a picture that captured the details of individual soldiers and the vast landscape where they stood. Each soldier had an individual facial expression: cynical, pleasant, watchful, friendly, fierce, bored, etc. There were horses too. Loved listening to what was known of that era and loved watching the archeologists and restorers at work. The museums included in the massive complex were wonderful too. I had so many terrific encounters with people during this trip. That’d be a long blog in itself. That’s it for this memory stream. I’m sure I’ll return with more. Have you been to China or going soon? Please share in the comments. I’d love to hear your stories. Happy writing, reading and traveling. 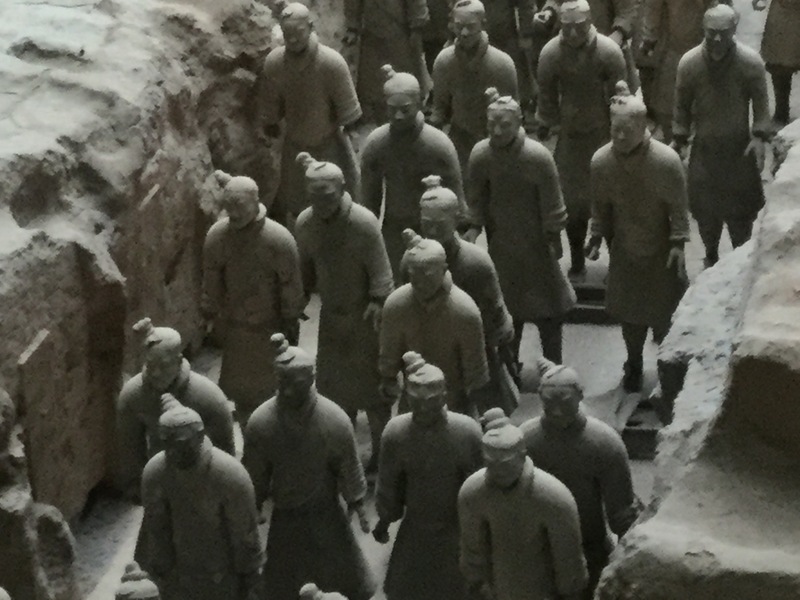 This entry was posted in Food, travel, Uncategorized, WRITING and tagged Beijing, China, Forbidden City, terracotta soldiers, Viking, Xi'an, Yangtze River. Bookmark the permalink.